We pulled out all the stops on this white shaker kitchen in Carlsbad, including stacked cabinetry to the ceiling, espresso bar, custom niche bookcase, & more! 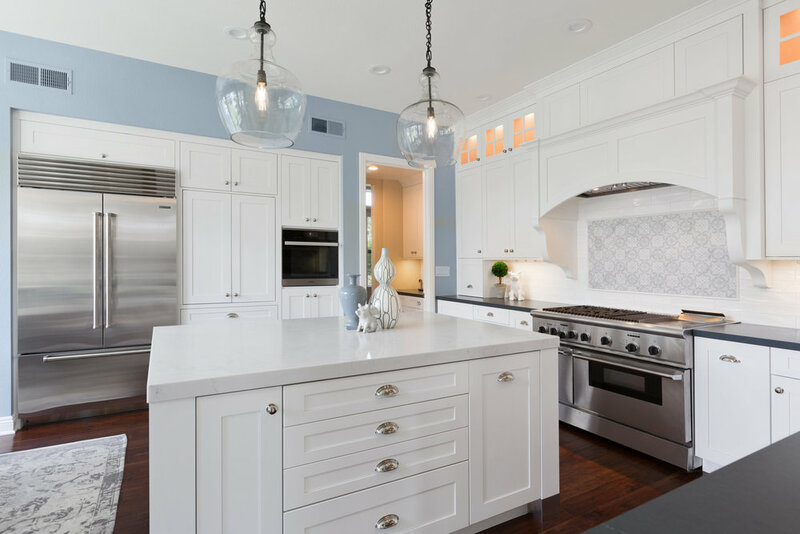 TaylorPro was delighted to do an extensive kitchen remodel to this couple's upscale home in Carlsbad. We pulled out all the stops on this sophisticated transitional kitchen with stacked cabinetry to the ceiling with glass uppers and lighting, an espresso bar cabinet with microwave shelf, fully customized hood with corbels, utensil base pullout, spice base pullout, two base trash/recycle pullouts, a base corner arena, drawer organizers, a custom niche bookcase, under cabinet angled power strips and more! The newly remodeled space features Transitional Bellmont Cabinet shaker style cabinetry with Quartz Aurea Stone's Paragon with 2-1/4" eased edge on the island top and Silestone's Charcoal Soapstone in Suede on the perimeter tops.